For all intent and purpose, Fallout 76 could have billed itself as Fallout 4 With Multiplayer, and people would be knocking down the walls to get in. Set in Appalachia, West Virginia, Fallout 76 is a Frankenstein’s Monster of various systems coming together in the hopes of providing an interesting, engaging experience. In reality, Bethesda pushed out a title that highlights the worst of its franchise while mostly ignoring what Fallout has always done best. 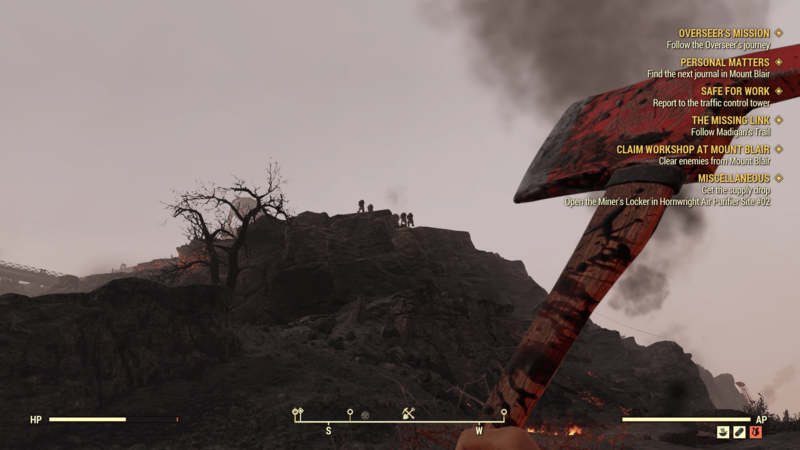 Fallout 76 is an open world multiplayer sandbox. As has become a series staple, you the player are a vault dweller who at the start of the game finds themselves pushed into the post-apocalyptic wasteland to do mostly whatever you want. The meat and potatoes of the game sits with the various quests that players will take on from letters, holotapes, and robots that dot the land. Bethesda’s decision to remove all of the NPCs and replace them with holotapes and robots has been called ambitious and it absolutely is in the same sense that being too cheap and lazy to shrinkwrap my windows is an ambitious take on the Buffalo cold winters. It feels like a natural conclusion to assume that Bethesda’s lack of human NPCs has less to do with immersive storytelling and more to do with not wanting to spend the time and resources on drawing, building, and animating those characters, preferring instead to recycle Mr. Handy models and stationary computers. Todd Howard stated that Fallout 76 is Bethesda’s most ambitious project, and I can’t for the life of me find out where all that extra work went. Visually, the game looks worse than Fallout 4, there are clearly less resources put into animating characters and scenes that might be found in a Fallout game. The assets are 99% recycled from previous Fallout games, evidence has come to light that enemies like the Scorchbeast had their AI code copied and pasted from Skyrim’s dragons, and the only thing new to the game seems to be the occasionally functioning online play. By all counts, Fallout 76 would be an impressive undertaking by a more competent group of programmers. Unfortunately, Bethesda is not that group. Perhaps analogous to the ultimate demise of Telltale Games, a company that refused to fix its aging, janky engine and ultimately paid the price for it, Fallout 76 appears to be floundering in a market where Bethesda previously seemed impervious to releasing a title that didn’t easily bring in more revenue than the GDP of a small country. It’s telling how seriously Bethesda is taking Fallout 76’s apparently disappointing performance, because they’ve actually started/committed to fixing bugs that have been present in the engine for several titles now. 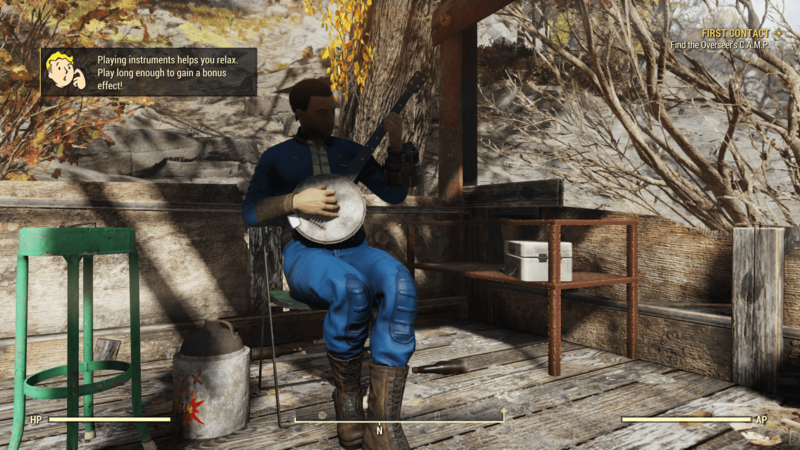 Fallout 76 is a landscape of wonderfully, shall we say, unique bugs. My character occasionally gives off a grunt like they’re being hit when nobody is around, like they’ve stubbed their toe but without taking any damage. I was forced to quit the game on several occasions because the depth of field bugged out causing the game to look nauseatingly blurry when walking around. I’ve hit points where my character will holster and then refuse to pull out whatever weapon I have equipped, where weapons/grenades get randomly unequipped, and where my character will simply not attack. Then of course there’s the building pop-in, where entire buildings will just not render and take minutes to show up. This would be unacceptable in an alpha release, but Fallout 76 wants sixty bucks for this amateur showing. 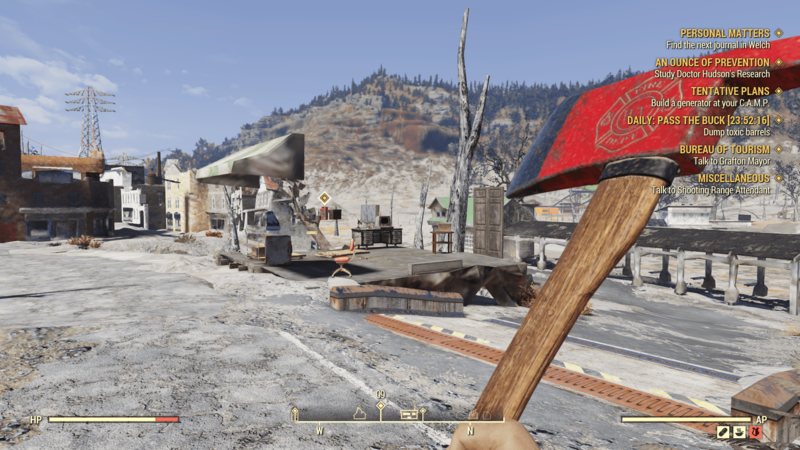 Todd Howard stated that you would never see a server for Fallout 76, and you won’t…unless of course you happen to have the bad luck of being placed on an unstable server and find yourself hopelessly hacking, whacking, and smacking against enemies that refuse to acknowledge your hits or find yourself smashing that play button only for the game to repeatedly tell you that there are no worlds available. They, on the other hand, have absolutely no trouble landing hits on your character in spite of any server lag. You may also acknowledge the server when, for instance, you fail a timed mission because the node you were required to hit simply didn’t feel like responding in time. Sharing a world with other players is both a godsend and a curse upon Fallout’s gameplay. 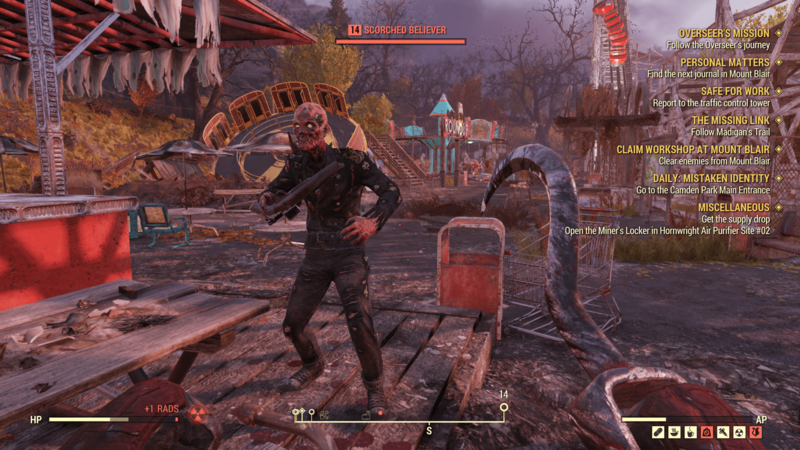 On one hand, Bethesda shakes up the formula by allowing people to tackle towns of scorched, mutants, or super mutants with friends and strangers. On the other hand they risk trivializing certain elements of the game as while player acts are constant, loot is not. In my experience, this led to numerous incidences where otherwise high level safes or locked doors were wide open, allowing anyone to loot their delicious innards just because someone at some prior point came through the same building. Bethesda loves adding quests into their games that require players to navigate buildings only to provide an easy way out once they find the macguffin. Because the door then does not shut for an indeterminate amount of time, anyone else taking on the same mission can simply walk in and finish the quest in a snap. This also means entering buildings with the goal of finding a mission item or to kill a specific NPC, only to find your target has already been taken by another player at some unspecified time. With the time it takes them to respawn, you’re honestly better off just going and doing something else. Then there’s the fact that a high level character can really ruin your experience. Enemies in most areas will automatically scale to the highest level player nearby, which means that if you the level 10 player are rolling around Grafton, you’re going to encounter generally level 10-15 super mutants. If Remy Remington and his clan of level 60+ hunters decides to take a stroll through the city, however, you’re suddenly going to find yourself getting steamrolled by level 60+ super mutants with crazy stats and buffs, making the area completely unplayable until those players leave. The worst part about playing Fallout 76 is the knowledge that there is something fun hidden under all of the technical issues. I like the world building elements like how every pack of perk cards comes with a joke and a stick of gum, or the various stories involving the war. Bethesda can do a lot with this game as an online living world and they plan to do so with in-game events, opening new vaults in further expansions, etc. If Bethesda can fix the more glaring bugs and create some semblance of an ongoing story that updates every so often, that would be great. I’d like to see a few of the prior Fallout staples come back into Fallout 76, like the ability to combine identical weapons in order to repair them. Weapons and especially armor break far too damn fast in this game, and you’re constantly on the lookout for items to make adhesive because if you’re like me you’ll be consistently out of it due to how much goes into repairing each piece of gear. I’d like bobble heads to be items that offer permanent bonuses for having them in your inventory, even if that means they have to be scaled down a bit, rather than consumables that offer minor enhancements for just a couple of minutes. I haven’t engaged in any PvP since launch simply for the fact that the feature is mostly vestigial and few people outside of hackers even use it, and the same goes for VATS. In terms of player vs player combat, Bethesda should just remove their current system and replace it with one for consensual duels and clan wars. Attacking someone in Fallout 76 is pointless since, unless they attack back, you can expend your inventory worth of ammunition and do enough damage to be nullified with a single stimpack. VATS on the other hand is a barely functioning mess that winds up being less accurate than simply aiming and firing your weapon. Odds are you will completely ignore both of these features in your time playing Fallout 76. And I haven’t talked much about the story because frankly I can’t find much attachment to it. There are no human NPCs in Fallout 76, this much has been made obvious, but Bethesda for some reason decided to tie a number of missions to radio distress calls that you need to respond to. The implication of course is that you’ll rescue someone, but you already know that whatever you come across is going to be dead, transformed into a ghoul, or a robot. That removes a fair amount of the suspense and interest. Otherwise questing rolls down to hearing about the lives of people who have lived before you, and are already dead or moved out of the area. It’s interesting, but only to an extent. If Fallout 76 is the most ambitious project that Bethesda has ever worked on, well a lot of people need to be fired for sheer incompetence. The state that this game is in is one that wouldn’t be acceptable for an indie developer early access launch, let alone a AAA developer with more money than God selling it for $60. I’m sure there are plenty of people who can find enjoyment out of the game as it is, but I’m not one of those people. 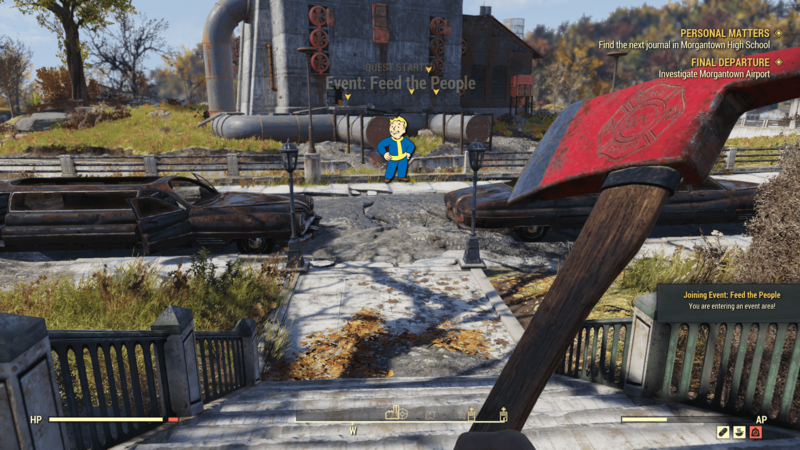 Verdict: 1/5 – Fallout 76 is an exercise in frustration that only gets worse the longer you play. What little redeeming qualities that the game has are overshadowed by crashing servers, crashing clients, lazy coding, persistent bugs, and other technical issues.